Abby Wambach, the world's all-time leading international goalscorer, was arrested on Saturday night for driving under the influence of alcohol. American Wambach, 35, retired in December 2015 after scoring 184 goals in 255 games, a record unmatched in international football. "I take full responsibility for my actions. 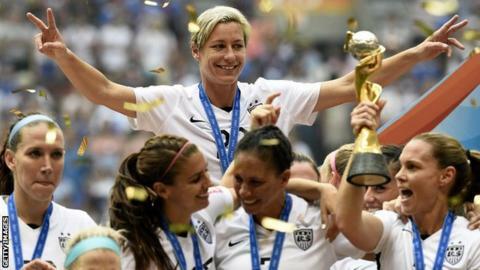 This is all on me," Wambach said in a statement on Facebook. Wambach helped the United States women's team to 2015 World Cup glory. According to local police, she was arrested in Portland, Oregon after being seen running a red light. Wambach failed sobriety tests and was booked into the Multnomah County Jail on charges of driving under the influence of alcohol. She was later released. In her statement, Wambach promised not to repeat her "horrible mistake" and apologised to her friends, her family and her fans, as well as "those that look to follow a better example". She added: "Those that know me know that I have always demanded excellence from myself. I have let myself and others down." Wambach was named the 2012 Fifa Women's World Player of the Year and is also a six-time US Soccer Female Athlete of the Year winner.